There’s always a new, hot trend on the Web, and aggregation suddenly seems to be where it’s at. The big question is: why and why now? Arguably, it’s because the more people use the Web to consume, create and share content, the more difficult to find what you want in one place. Aggregation services are, in a sense, the Web’s 7-11s where you can find a variety of stuff (although far from everything) at a single location. I have to admit that I read several aggregation sites daily. BUT, I have to disagree with Mark's conclusion that that they are the "the Web’s 7-11s where you can find a variety of stuff... at a single location." Personally, I almost never go to these locations. I use them initially as a mechanism to browse what's being aggregated, and then subscribe to the requisite feeds. It's a way of previewing a feed. Once subscribed I rarely, if ever, go back to these sites. The one-shop-stop is your feedreader, or perhaps your iGoogle, Pageflakes, or Netvibes pages. This conversation around aggregators started when Sarah Perez at the ReadWriteWeb wrote a piece on Breaking the Techmeme habit. I read Techmeme's feed daily. I very rarely click through to Techmeme, however. When I do, it's because I want to see what others are saying about something that has caught my interest. I visit Techmeme because I want to see the broader conversation. I don't do this very often. Apparently I'm not the only one who doesn't visit. 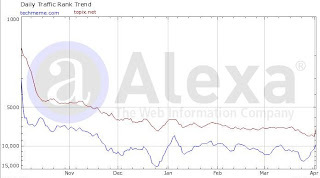 A quick look at the site rankings on Alexa for Techmeme, and Topixnet, another popular aggregator, shows that their site visits are actually dropping. Do I think people aren't reading these sites anymore? Not at all. I think the drop corresponds to the broader adoption of syndication feeds. I'll have a post show up on Techmeme every now and then. Perhaps this one will appear? You'd think that a link on Techmeme would generate a good deal of traffic. Nope! For me, Techmeme ranks 12th as a referring site. To provide some context, Twitter ranks 2nd, and sends eight times more people to this blog. That tells me that very few people are actually leaving their feed readers and clicking through. We see this same behavior all over the Web. This begs the question as to a sustainable business model for aggregators. Got me! I'm glad I don't have to worry about making money on the Internet. Anyway, FWIW, I don't think aggregators are going to change the web or make anyone google-rich, but like many unsung but useful applications of technology, they'll find valuable niches anyway. Click "stories" to see the posts from each, "xml" to see the feed that those posts came from. Enjoy! Thank you for your comments and for sharing the links. I spent a good bit of time looking at the compete metrics. Very interesting. I think you and I are in agreement. I find aggregator sites quite useful, and am even involved trying to build some in our own niche. I mostly took exception to Mark's "aggregator festival" remark. I don't think we've got a big new trend taking place, and I don't think they'll ever be big "destination" sites. Important site to the audiences they serve-- absolutely. I'm sure Topix is growing nicely too, based on various things they've said. If you look at the compete.com data that is cited about there's nothing there to indicate growth either. Techmeme looks flat at best. Topix.net looks to be off 20% from its peak. I have no doubt that the readership of both of these sites is actually up. But there's no evidence that people are coming to the sites in greater numbers, and I suspect that those numbers will continue to decline. The trend -- readership up -- live bodies, actually visiting the sites -- down. With topix and techmeme we're also talking about the premiere sites in their fields. I wonder what we would see if we looked at the 2nd tier? My post is not about the value of these sites. I like and use both of these sites. My post is about the fickle nature of user behavior. Kevin, my point is that Alexa and Compete are wrong. Traffic to the web site itself is up. There is no valid foundation to your post, just an invalid one. I'm willing to be convinced, but I'm a data driven type person. I'd like to see some numbers that refute my point. Given my last presentation on helping staff keep up with technology, I purposely stayed away from "traditional" aggregators which I thought too technical. This is the same problem we have explaining RSS. An aggregation service needs to be transparent. I think we would agree that sites like iGoogle and Netvibes have more of a future. One reason is they provide windows into these aggregation services transparently for users and then allow them to manage them.